We often joke that Florida has two seasons, hot and hotter. We also generally have a dry fall and winter season that gives way to a wet and humid summer. Although our mangoes and avocados put out inconspicuous blossoms, south Florida experiences no explosion of color to mark the onset of the vernal equinox. No cherry blossoms or azaleas here! The mockingbirds sing all year around, though their tempo and volume picks up just as the Palm Warblers depart to breed in far northwestern Canada. Up north, robins herald the arrival of spring, but we rarely see a robin at any time of the year. For birders looking for warblers, spring migration can be a non-event. If the usual east-west wind pattern persists, it drives northbound birds to the west coast of the Florida peninsula, or they may fly directly from Cuba across the Gulf of Mexico to make landfall. One conspicuous bird that can be counted on to arrive at our back yard lake in the middle of April is the Least Tern (Sternula antillarum). 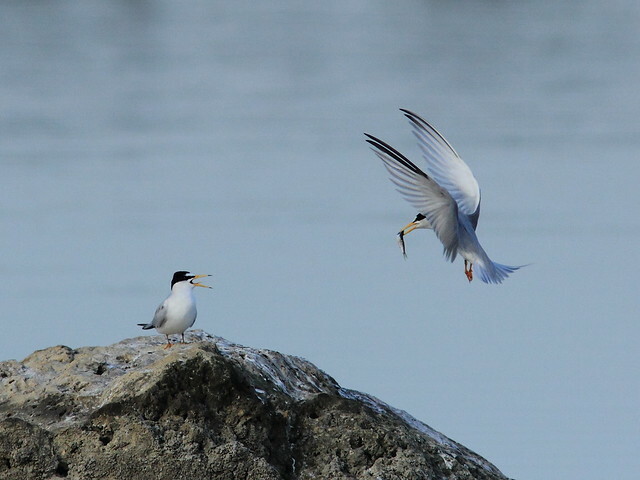 While it is the smallest of the tern family at about 9 inches long with a wingspan of 20 inches, it makes up for its small size with graceful energetic flight, strident calls and interesting behaviors. 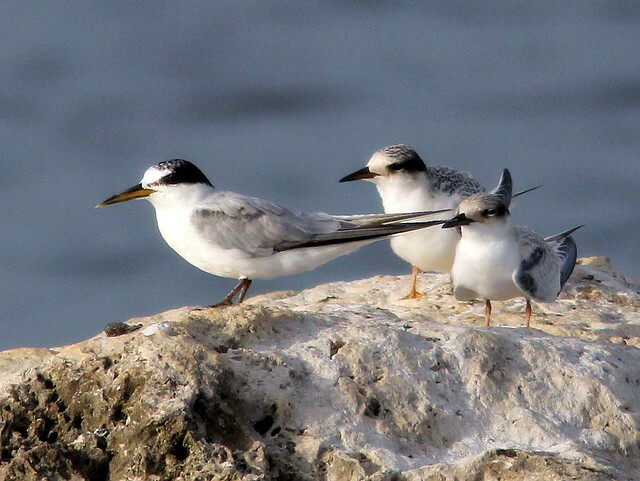 There are three distinct populations (subspecies) of Least Terns in the US. One group nests in limited areas on the beaches of western Mexico and California. A second finds sandy places to nest along rivers and streams in the mid-west. Both of these populations are of particular conservation concern. With protection of its nesting areas, the endangered California population has increased from less than 600 pairs in 1974 to over 4500 pairs, while the interior subspecies has increased to 7,000 pairs from a low of 1,000 pairs in 1985. Our Florida birds belong to the third subspecies, which breeds up and down the entire US Atlantic coast, wintering in the Caribbean and along the east coast of Central and northern South America. All three populations face threats from human activities, notably destruction or disturbance of beaches and loss of beach and stream-side habitat. Plume hunters took a huge toll in the late 1800s-- I have seen photos of ladies' dainty hats adorned with the whole bodies of one or more Least Terns. Though not on the Endangered Species list, the U.S. 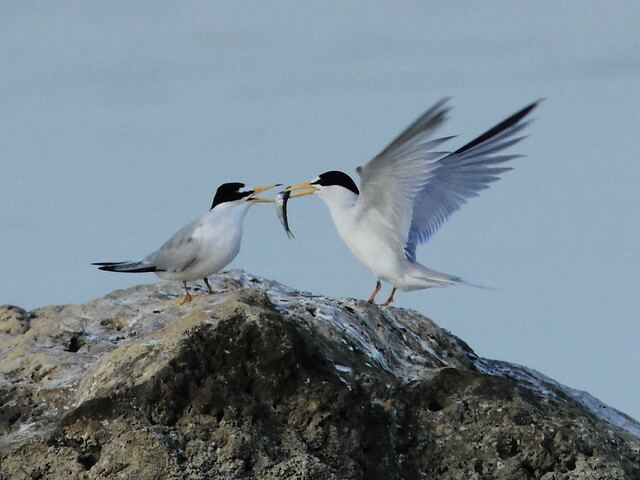 Fish & Wildlife Service lists the east coast Least Terns as a Species of Management Concern. 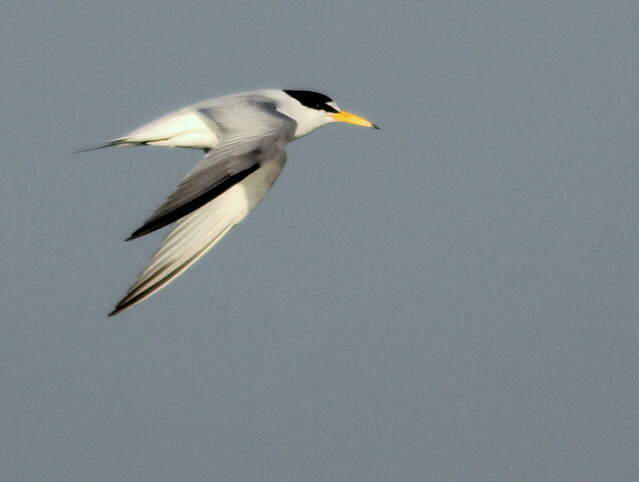 I bought my Canon 60D camera just a year ago, and my very first practice flight shots were of Least Terns flying past our back patio. This was my first "keeper." 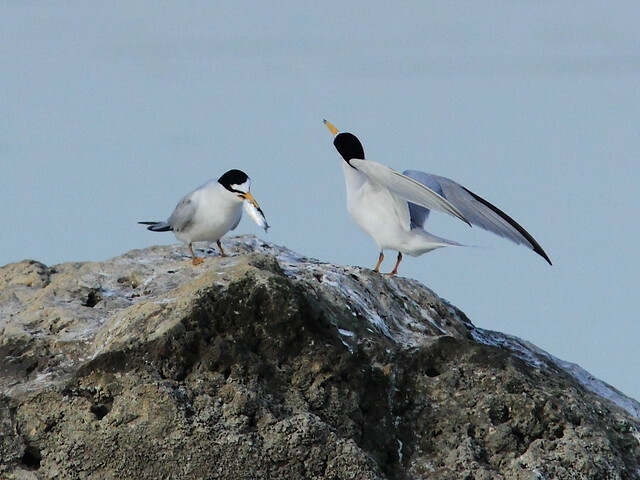 This spring the terns began competing for mates as soon as they arrived. Once bonded, the pair stays loyal to each other for the entire breeding season. The male must prove his prowess as a provider by catching a fish and offering it to his intended mate. The male and female plumage is very similar. During breeding season, the males are said to have brighter orange-yellow bills, legs and feet, though this is not very noticeable. 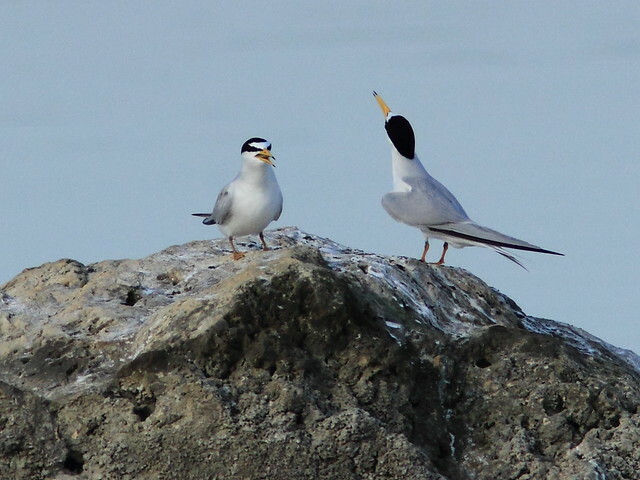 Following the age-old Least Tern courtship ritual, the female waits patiently while her suitor hunts for a small fish. When he catches one, he calls excitedly and flies toward the female's position, sometimes adding a dramatic flourish by swooping past her. The female eagerly awaits his arrival, calling back and begging. 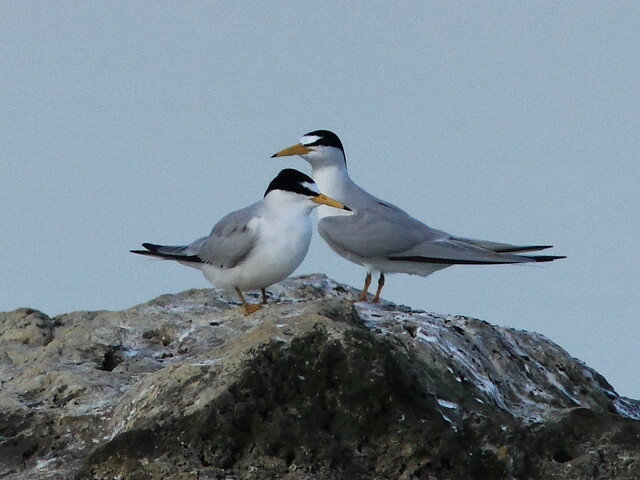 Last summer these two immature terns were being trained to fish by their parents. The adults would catch a fish and make their youngsters chase after them. The adults would then drop the fish in the water and fly down as if to get to it before the "trainees." If not retrieved, the parents would pick up the fish and try all over again. Note that the white area on the forehead of the adult, to the left in this photo, is enlarging. After breeding their bills and feet also become darker. 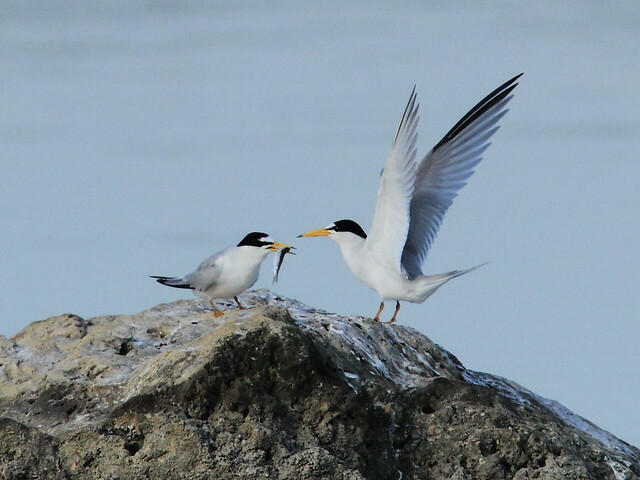 A wonderfil post Ken, Least Terns were a favorite of mine when I lived in Florida. Thanks, Mary. I think Robert controls the comment approval, as I simply contribute my blog and do not otherwise make cahnges on the dashboard. I will look into it, as I am considering moving my regular blog to Blogger or Wordpress. Awesome Ken, great to observe such interesting behavior--thanks for sharing. Terns are such graceful birds; you've captured them beautifully. The weather here in Portland, OR is quite the opposite! Wet and wetter. Thanks for sharing this interesting post. 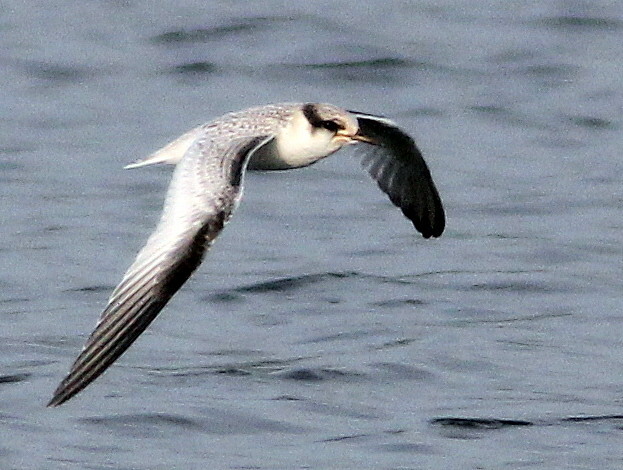 I love the photo of the tern in flight with its wings downwards. The colors are great. I'm writing on behalf of the KEEN Recess Team, because we're trying our hardest to get people outside and active. We've launched our Recess campaign to motivate people to take a break and get outdoors. I'd love to have your expertise and input for this project. You can check out the site here: http://recess.keenfootwear.com/birding/ and put some of your favorite birding locations on the map. This is not about the terns, but I thought you would all be interested in this amateur video posted about a bald eagle. The prey is too heavy for him/her to lift out of the water, so he actually lands on it like a duck and then swims it to shore--using his wings like arms--it is really incredible and very unusual bird behavior! Wow!!! Nice clear shots of these beauties. Sorry the link wouldn't publish---it can be found on you tube under "swimming eagle of baton rouge"
This footage was taken at Mallard Lakes subdivision in Baton Rouge . Someone had shot a nutria Rat, and it was floating dead in the water. Una serie realmente fantastica, son todas preciosas, pero la 4 toma me encanta. Felicidades. Ken, a most informative post filled with exceptional images! It's always fun to observe the courtship rituals. You captured them beautifully! Fantastic post! Wonderful photos! How amazing that these guys are one of your 'backyard' birds! 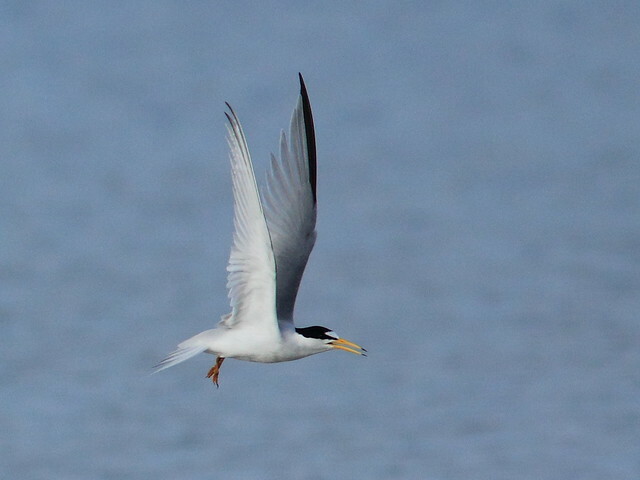 It just so happens that I saw my first Least Terns ever this last weekend at North Carolina's Crystal Coast. We got to see one pair trying to feed each other like you portrayed. Awesome post! Great post Ken! I, too, love watching the Least Terns. They arrived here in the beginning of April as well. I've never observed the lovely courtship behaviors you've documented though, great photos! Great post, Ken! The Terns are one of my favorite summer birds. Wonderful photos. Thank you all for your kind comments! We've just migrated to NE Illinois and hope to catch up with the northbound avians who mostly passsed over or around South Florida this spring. Wonderful info and photos! I love learning about the behavior.